Buck is the NGSPA 2008 AA Dog of the Year!! Buck takes runner up in 2008 NGSPA Reg. V All Age Championship. 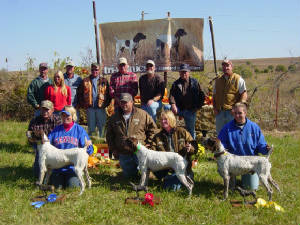 Buck is Runner up in the 2008 NGSPA Quail Championship!!!! Buck takes 3rd in the GSPCA National All Age Championship!!!!!!!!! We would like to Thank Frank Pike for giving us an oppourtunity to own Buck and let him finish out his trial career with us. He was a wonderful addition to our family. 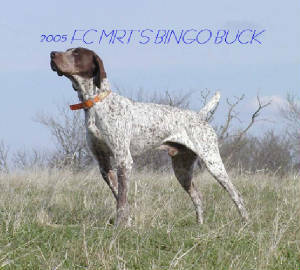 Buck was retired after the spring of 2009, after winning the Quail Championship. Buck is now in Nebraska spending his days hunting and training youngsters. Buck's accomplishments are something we were proud to be a part of and could not have done with out the great trainers and friends, Keith and Robbi Gulledge of Blue Dawn Kennels. Thank you for everything.